Upload your video and audio files directly from your computer. You can upload single or multiple video and audio files directly from your local computer to the StreamingVideoProvider Media Cloud. 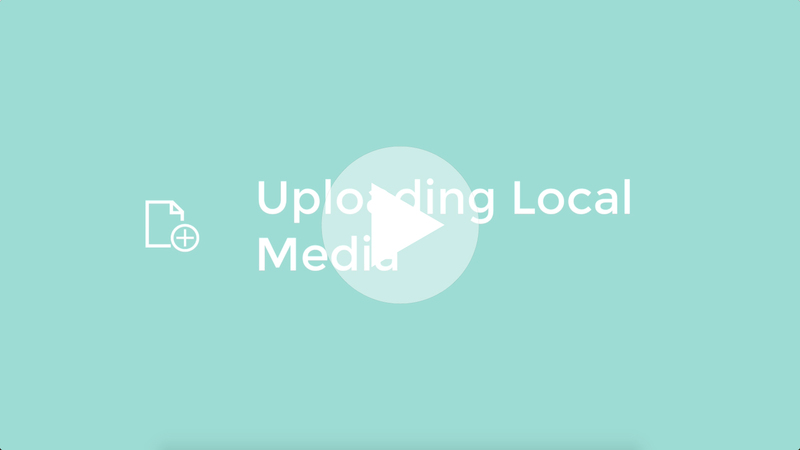 In this article we will guide you though all the necessary steps to upload local media files. You can also find more details about uploaders on our Uploaders Feature page. To upload local media from your computer click on the All Media button in the left hand navigation bar. By Default Local Upload is selected. Here you can click on the Choose Files button which will open your computer's native file browser. Now simply navigate to the folder where you have the videos or audio files that you would like to upload. You can simple select one or multiple videos or audio files to be uploaded. Once ready click on the Choose button from your file browser. This will add and list the selected videos in the the Upload Queue where you can revise or remove them before uploading. Destination: Here you can choose if you wish to add the selected videos and audio files to the Default Playlist which is the where any videos and audio files that are not part of a specific playlist will be located. Or if you wish to upload to a specific playlist. If you type in any Metadata in the upload form before uploading, it will be applied to all of the videos and audio files that are being uploaded. Now simply click on the green Upload button to start uploading. The Add Media popup will then be minimised to a icon in the bottom right cornerof your panel. Showing you the progress of your upload until completed. You can click on the Percentage icon in the panel whilst uploading to show detailed information of your upload, Pause the upload or cancel and deleted any uploads you don't want anymore.